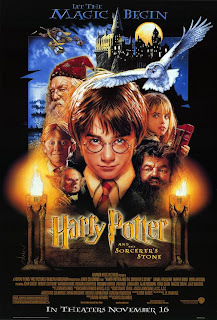 Harry Potter Retrospective Part I - "The Sorcerer's Stone"
With the end of the "Harry Potter" film franchise quickly approaching, I've decided to dedicate The Soap Box Office to this wonder filled series for the next week. We'll call it the "Harry Potter Retrospective" because I really like the word "retrospective." Each day, I'll briefly take a look at one of the films, compare them to each other (and possibly the books, too), and delve into my personal experience with each. I invite you to join in the discussion as we prepare for the final chapter of Rowling's wizarding world. "The Philosopher's Stone"/"The Sorcerer's Stone"
I'm not sure how many people out there are in the same boat as me, but I went into the first Potter film without having read a single page of the books. My brother, sister, and mom had read them but I had resisted. For one thing, I wasn't much interested in reading a children's book even if it did involve the sort of nerdy fantasy that I enjoyed. For another, this series was far too popular for me. I've always enjoyed rebelling against what everyone loves and Pottermania was too much for me to get on board with. My introduction to Harry Potter came on Thanksgiving Day 2001 when my family, for the first time ever, decided to see a movie on a Holiday and this was their choice. Strangely, I think my appreciation for "Stone" has grown over the years when it seems like the type of film that would get worse and worse with each viewing. Each time I watch it, I am reminded of how smart producer David Heyman was when he put the first part of this franchise together. First off, he got the right director. Now, Chris Columbus has been depressingly retched since his time with Harry Potter ended but when he started, he was the perfect man for the job. He had a track record of making fun family films that appealed to children and adults alike and even more importantly, he understood how to work with kids. That point can't be underestimated enough especially when you consider that the vast majority of his young cast was completely and totally inexperienced as actors. You can tell while watching "Stone" that the kids had fun working on this film and that youthful energy often covers over the rougher acting moments. Second, Heyman and Columbus together knocked it out of the park when it came to casting Harry, Ron, Hermione, and the rest of the young characters. To cast a group of child actors is exceedingly risky when you've got one film to think about; it's almost impossible when you're looking at seven or eight. You have to hope and pray that as they get older, they continue to improve as actors, they stay out of serious trouble, and they look appealing ten years later. Save for a few blips, the people behind Harry Potter did about as good as you could ever hope. Daniel Radcliffe has embraced the spirit of Harry Potter brilliantly, Rupert Grint has turned himself into the most likely cast member to have a legitimate career after Harry, and Emma Watson, the absolute worst actor in the group in "Stone", has practiced and refined her craft to the point that she rarely has an off-key moment. On top of that, they all seem to handle the incredible pressure that comes with these roles with relative ease and that can never be underestimated. They all have horrible moments in "Stone" of course, but in my book you always see the potential they had. I'm not sure how many people out there are in the same boat as me, but I went into the first Potter film without having read a single page of the books. My brother, sister, and mom had read them, but I had resisted. For one thing, I wasn't much interested in reading a children's book in my late teen years. For another, this series was far too popular for me. I have a contrarian streak within me, even more so when I was younger, and Pottermania was too much for me to get on board with. 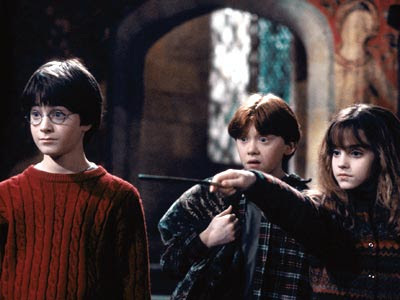 My introduction to Harry Potter came on Thanksgiving Day, 2001 when my family, for the first time ever, decided to see a movie on a holiday and this was their choice. Strangely, I think my appreciation for Stone has grown over the years when it seems like the type of film that would get worse and worse with each viewing. Each time I watch it, I am reminded of how smart producer David Heyman was when he put the first part of this franchise together. First off, he got the right director. Now, Chris Columbus has been depressingly wretched since his time with Harry Potter ended but when he started, he was the perfect man for the job. He had a track record of making fun family films that appealed to children and adults alike and even more importantly, he understood how to work with kids. That point can't be underestimated, especially when you consider that the vast majority of his young cast were completely and totally inexperienced as actors. You can tell while watching Stone that the kids had fun working on this film and that youthful energy often covers over the rougher acting moments. Second, Heyman and Columbus together knocked it out of the park when it came to casting Harry, Ron, Hermione, and the rest of the young characters. To cast a group of child actors is exceedingly risky when you've got one film to think about; it's almost impossible when you're looking at seven or eight. You have to hope and pray that as they get older, they continue to improve as actors, they stay out of serious trouble, and they’re still appealing on-screen presences ten years later. Save for a few blips, the people behind Harry Potter did about as good as you could ever hope. Daniel Radcliffe has embraced the spirit of Harry Potter brilliantly, Rupert Grint has turned himself into the supporting star, and Emma Watson, the worst actor in the group in Stone, has refined her craft to the point that she rarely has an off-key moment. On top of that, they all seem to handle the incredible pressure that comes with these roles with relative ease and that can never be underestimated. They all have horrible moments in Stone, of course, but in my book, you can always see the potential. Third, to fill the adult roles, Heyman assembled one of the best ensemble casts in recent memory. Maggie Smith, Richard Harris, Alan Rickman, and on down the list, the Stone cast list reads like a Who's Who of great British actors and it only grows in the following films. Though their roles are fairly limited early on, these great talents do a remarkable job of balancing the inexperience of the kids and drawing attention to themselves in just the right moments. Fourth and most importantly, Heyman was smart enough to let the world that J.K. Rowling laid out in the book be the focus of Stone. There are some changes here and there, sure, but excluding cosmetic issues, Heyman and Columbus brought the pages of that book to life and let the audience bask in the experience. I obviously didn't understand that the first time I saw this film but even as a first time Potter-er, I was easily wrapped up in the delicately designed universe that Stone introduced me to. The landscapes, the decor, the meticulously detailed wardrobe and set pieces all join together to create a deliciously inviting atmosphere that is difficult to turn away from. Beyond that, though, this glorious presentation takes all the pressure off of Radcliffe, Grint, Watson, et al. It's clear that Stone isn't about the actors and it's not even really about the characters; it's about the world in which these characters live. It is a perfect introduction to Rowling's vision whether you're a fan of the books or not. It's obvious that this is not the best of the series. The story is (purposefully and rightly so) much less dynamic and serious as the other films, its actors are rough in some places (Watson and Tom Felton in particular), and the special effects sometimes lag behind. But I always view Stone with perhaps more fondness than I do any of its sequels because it opened me up to a magnificent world I might have missed out on otherwise.